Schnauzer Colors are of great interest to me. 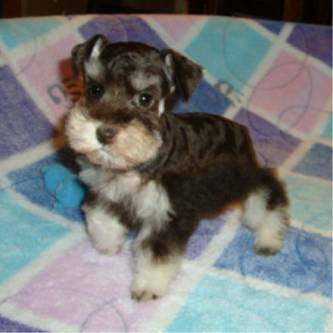 The miniature schnauzer comes in Black, Black and Silver, Salt and Pepper, Chocolate or Liver, Chocolate Pepper or Liver Pepper, Chocolate and Tan or Liver and Tan, Chocolate Parti, Salt and Pepper Parti, and Black and White Parti. These colors appeared when the Standard Schnauzer was bred down to the Miniature size in the late 1800’s. 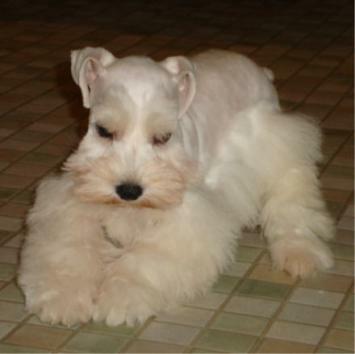 Breeds such as the Affinpincher, the Dutch Poodle and the Fox Terrier were bred to the miniature schnauzer, in order to bring the size of the Standard Schnauzer down to a Miniature size. 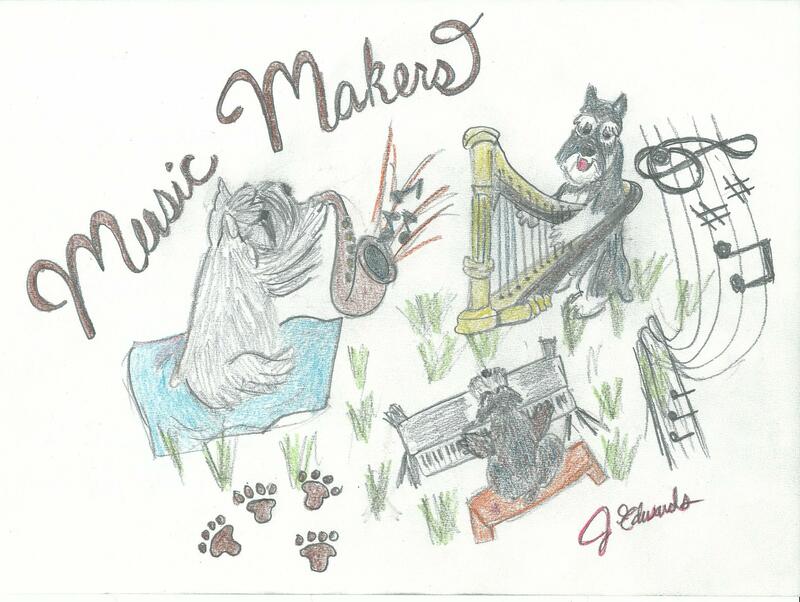 If you would like to know more about our chocolate teacup schnauzers, liver schnauzers, or white miniature schnauzers in Cleveland, TX, check out my Info page on the toy and teacup schnauzer. A Little About THE CHOCOLATE (LIVER) SCHNAUZER. The chocolate schnauzer is a very striking dog. They have green eyes and brown noses as well as brown pads on their feet. As in other breeds the chocolate schnauzer is a distinct color, not a faded black. 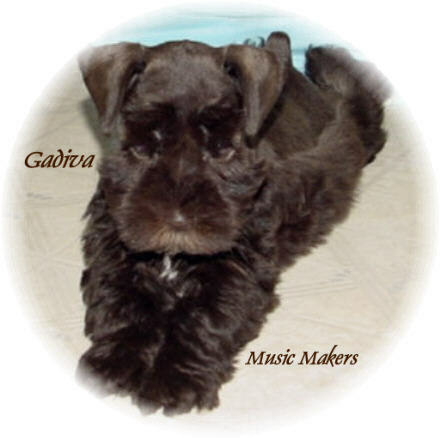 Another variation is the liver and tan which is like the black and silver schnauzer-a solid chocolate body with tan markings on the fronts of the legs, sides of the face, eyebrows, and under the tail and chest. 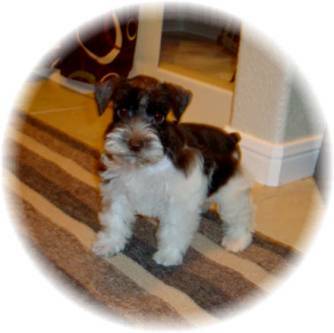 Also the chocolate or liver and white parti is a form of the chocolate colored schnauzer. It has a base color of white with a chocolate saddle or spots and may have a mask of chocolate surrounding the eyes and ears. 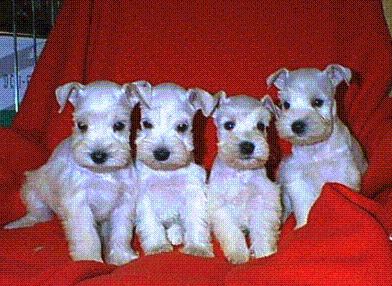 The white Miniature Schnauzer is one of the most beautiful of all of the Schnauzers. It is not an albino or a defect in the breed. 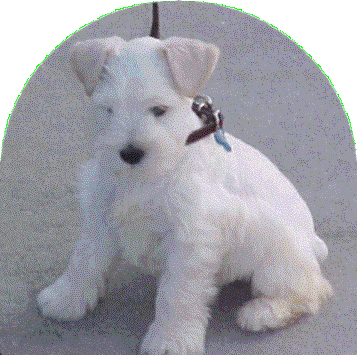 The white miniature schnauzer is a product of the gene pool produced when the Standard Schnauzer was bred down to the miniature size. My white schnauzers are soft coated and have good confirmation. They are of excellent health and longevity.